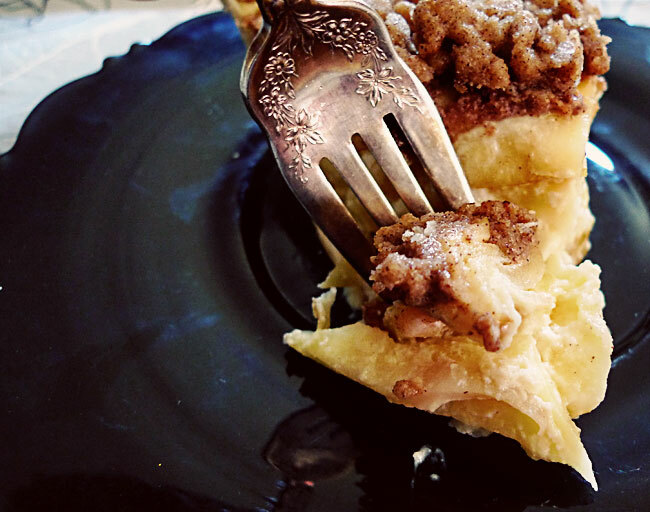 This is my favorite apple pie recipe. 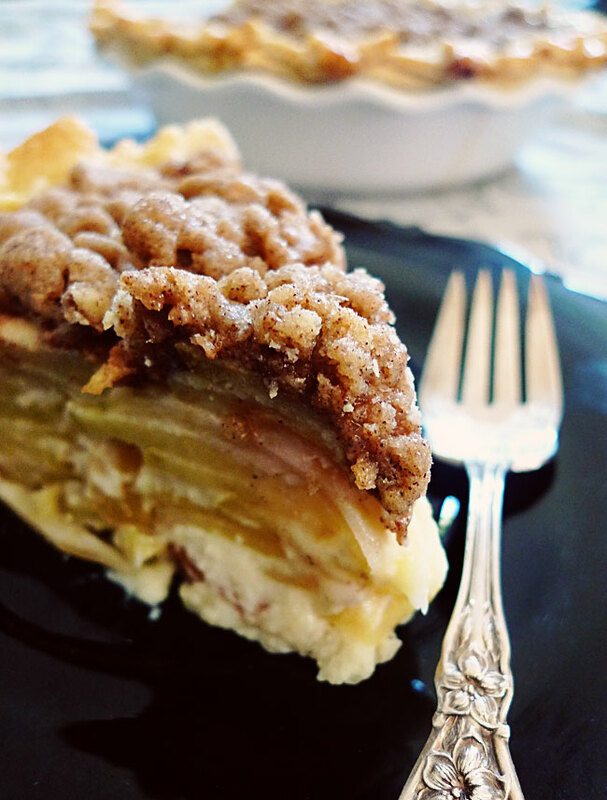 I love the sweet streusel topping and the apples layered with just the hint of sour cream. Try it once, and it'll be your favorite too! In a large bowl, combine flour, sugar, salt, egg, vanilla, and sour cream. Add sliced apples, toss gently to coat. 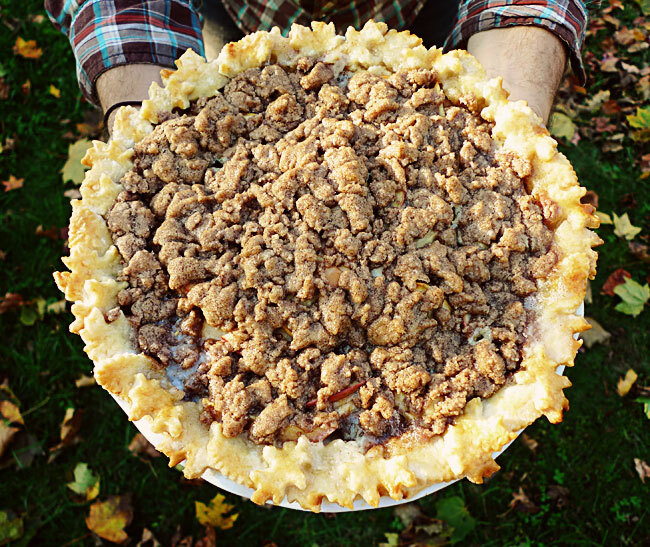 Layer coated apples in the unbaked pie crust, avoiding empty spots and piling up slightly in the middle. Bake at 425 degrees for 15 minutes. Combine flour, sugar, and cinnamon in a medium bowl. Cut in butter until mixture resembles coarse crumbs. Once pie has baked for 15 minutes at 425 degrees, remove from oven and sprinkle streusel over the top. Reduce heat to 350 degrees, and continue baking for 30-40 minutes, until apples are tender but still firm (test with a toothpick). Cool, then enjoy! Can be served warm, room temperature, or cold. 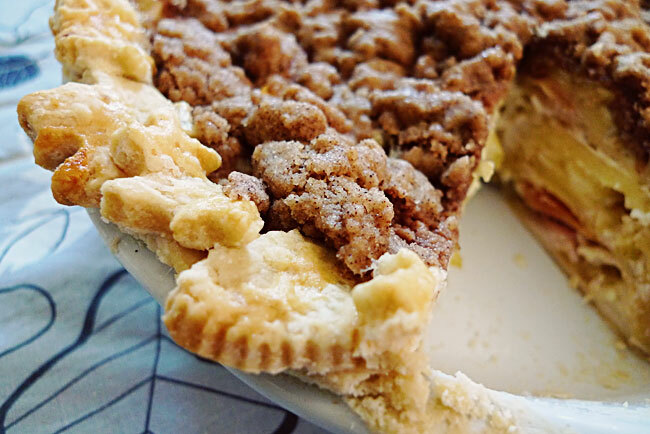 Note: I used mini leaf cookie cutters to decorate the crust of my pie, but you can finish off the edges any way you'd like. To get the crust perfectly golden brown, brush with a beaten egg white before baking, and if the crust is golden before the pie is finished baking, cover the edges with foil to prevent over-browning. I made this for a party I was attending on Memorial Day. Since I was singing in the choir, we were a bit late arriving. Most guests had already eaten. I set the pie on the counter and began visiting. A guy saw it and took a slice. He raved about it, so another guest took a slice. She went back for another. Thank you! The pie was gone in less than five minutes. Thank you, thank you, thank you! Made this a couple of times, it's always a hit. Once I substituted in half the apples with blueberries --> awesome! And once used mascarpone instead of sour cream = super rich. I usually increase the streusel by 1.5x and add 3/4 cups of oats. Really great recipe, thanks for posting it! Hi! I'm making this today, and wondered what type of apples you use?